“Everyone knows one another. That’s because some people have never left Climax,” said Jill Shipman Retterer as she and a few friends strolled the village — once known as Ray City — tucked away on County Road 59 in Canaan Township near the Marion County border. The Block, as the locals have called it for decades, is actually several streets that connect about a dozen homes in the village. No longer boasting any commerce, Climax is a community of residential dwelling; all of the residents know one another and a few are related. Some folks have been here a long time. Most notable is Virginia Hedrick, who has surpassed 60 years. “Our family owns half of Climax,” she said with a laugh. Hedrick resides across the road from where the town pump remains and a community building once stood. The Climax Community Club met there and served meals back in the day. Hedrick said you had to be a really good cook to belong to that group. Retterer, her mother, Twila Shipman Gist, Hedrick and her daughter, Peggy Hedrick Zaebst, talked about growing up in the tiny village. Zaebst left for Johnson City, Tennessee, in 1978 and now resides near Raleigh, North Carolina. But she comes home frequently to visit her mom. “As kids we spent many hours on this bridge,” Retterer said pointing to what’s left of a dried up creek bed below the road. A post office was established on Feb. 21, 1881, but was closed on Aug. 15, 1929. Like most villages of that era, Climax boasted a town hall, grain elevator, school and churches, including the Evangelical United Brethren Church. The grain elevator burned in 1962 shortly before the railroad was abandoned. The church was rededicated in 1963 with a ceremony. Chauncey Woodworth served as pastor. 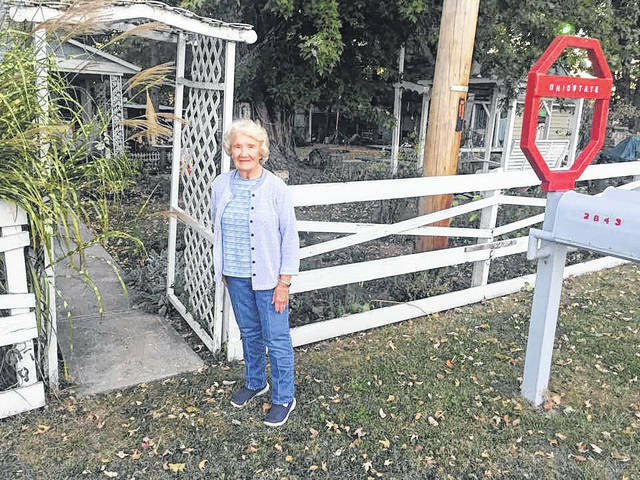 A boarded up building reminds residents of where the general store — once owned by Ted and Margaret Ginn — stood on the east side of Center Street. At its peak it reportedly had about one hundred residents. The origin of the name Climax is linked to the Toledo and Ohio Central Railroad depot. In 1880 two track-laying crews were working toward each other, one from near Columbus and the other from Fostoria. The crew decided to name the spot where they met Climax. That spot turned out to be Ray City. 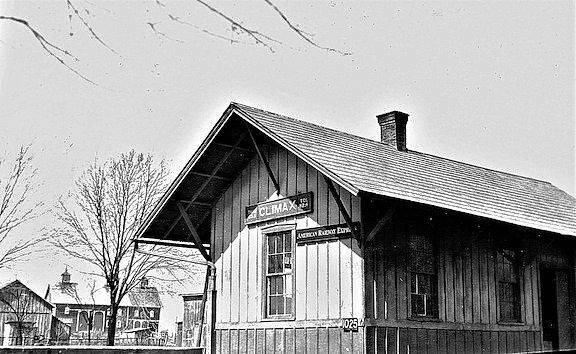 A depot was built and named Climax, and the village fairly unceremoniously adopted the new name. The one-room school was the last in the township to close its doors. In 1939 students were sent to Edison. The site is now a well-maintained residence. Today students living there attend Mount Gilead schools, while the Northmor school district sits to the east of the village and the River Valley district lies to the west. About a century earlier Tidewater Pumping Station was built there. It was one of a series of pumping stations from oil fields ranging from Texas to the east coast. Oil played a key role in the township’s history. Tidewater closed in the early 1950s when the pipeline was taken up and the pumping station abandoned. John G. Clark purchased the station and buildings and a box factory was built, which was sold in 1975 to Field Container Corporation. The operations later moved to Marion. Old photos remain in scrapbooks and prominent surnames like Brooks and Feigley can be found in those worn newspaper clippings. Retterer left Climax, but not for long. “I went to college a while and came back,” she said. Interestingly, roadside signs bearing the name Climax never last long. “Every one of those signs came up missing,” Hedrick said. A previous story quoted residents as saying that Climax had more dogs than children. At least one family still raises chickens. “Your neighbors are like family,” Retterer said. “And it’s stayed that way,” Hedrick added. Courtesy photo Climax railroad depot. The barn in the background remains on Jill Shipman Retterer’s property. The appearance is different because it suffered a fire. https://www.galioninquirer.com/wp-content/uploads/sites/38/2017/11/web1_railroaddepot.jpgCourtesy photo Climax railroad depot. The barn in the background remains on Jill Shipman Retterer’s property. The appearance is different because it suffered a fire.